Happy Labor Day for those of you who are posting on Monday night! I hope you have all had a great and relaxing weekend. I am sharing the most ridiculously decadent desert EVER! I made it for a church gathering Sunday night. I found this recipe when one of the women in our foodie blog community shared it for Tempt My Tummy Tuesday. I have made it on several occasions. I want to give credit where credit is due. So, thank you Janelle at Comfy in the Kitchen, for sharing your sweet awesomeness with us. 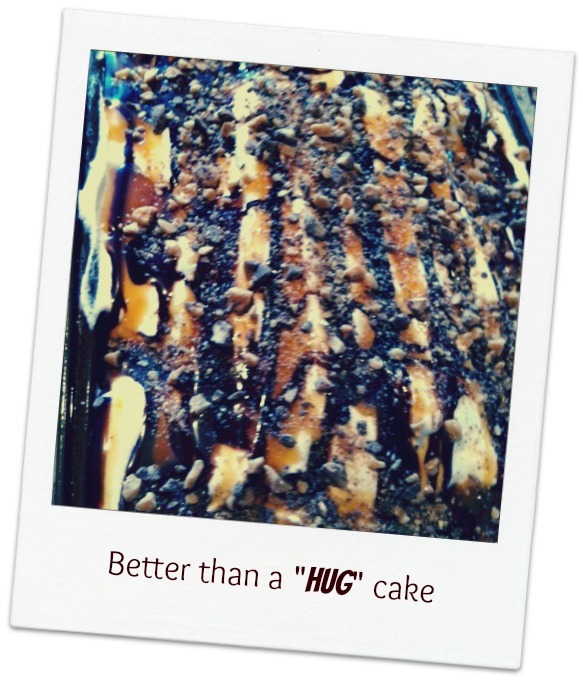 Please go to Janelle’s blog to see this recipe for Better Than a “Hug” cake. Her blog is full of wonderful recipes! Everyone at the dinner party LOVED it! Below is my picture of the cake. I am sorry I never got a pretty picture of the desert sitting on a plate. No one would be patient enough for me to take a picture before they started eating! With all the chocolate and caramel syrup, whipped cream, and crushed Heath bar… who could blame them? I can’t wait to see what you are cooking up. Lisa, that cake sounds wonderful, I don’t blame everyone for being impatient to cut into it. Thanks for hosting and have a great week. I can’t wait to try that awesome cake. Hope you are having a great day and thanks for hosting. No wonder everyone dug into it so quickly…it looks delicious!!! That sounds SO good. As in I really shouldn’t know about it good. Y.U.M. Thanks for hosting! I am sharing my post on how to make raw milk yogurt in either a crockpot or thermos. Next post: 18 Years and Counting….